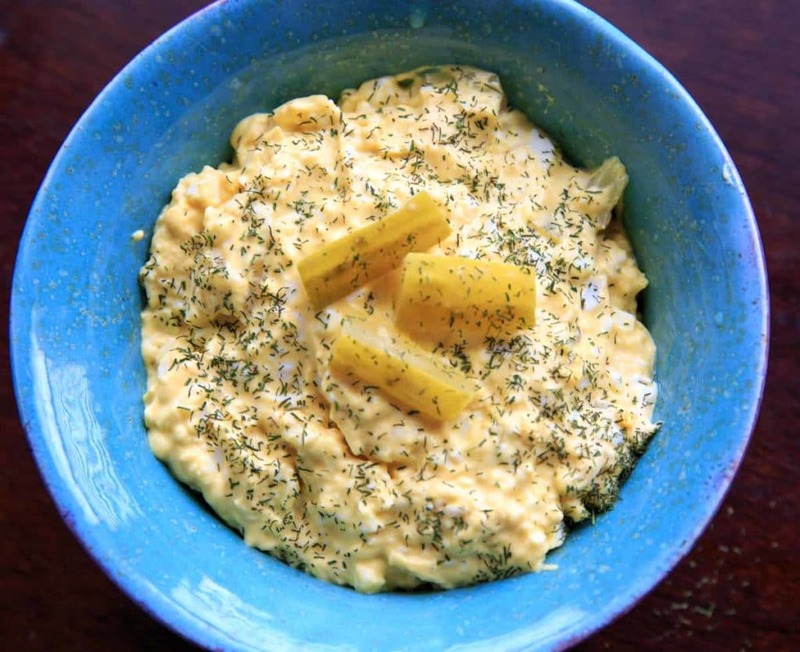 Dill Pickle Egg Salad – serve as a side or eat as a meal. Light on the mayo and big on the crunch! Originally I planned to make a dill pickle pasta salad, but before I realized what was happening, I was boiling eggs instead of pasta. So, dill pickle egg salad it is. Strange, because I don’t make hard boiled eggs much. I have to be in the right mood to eat eggs, and that mood can change very quickly. Mayonnaise and I aren’t great friends. Any salad that has too much of it I can’t stomach, and I never put it on sandwiches any more. Because I’m not a big fan, I went really light on the mayo here. 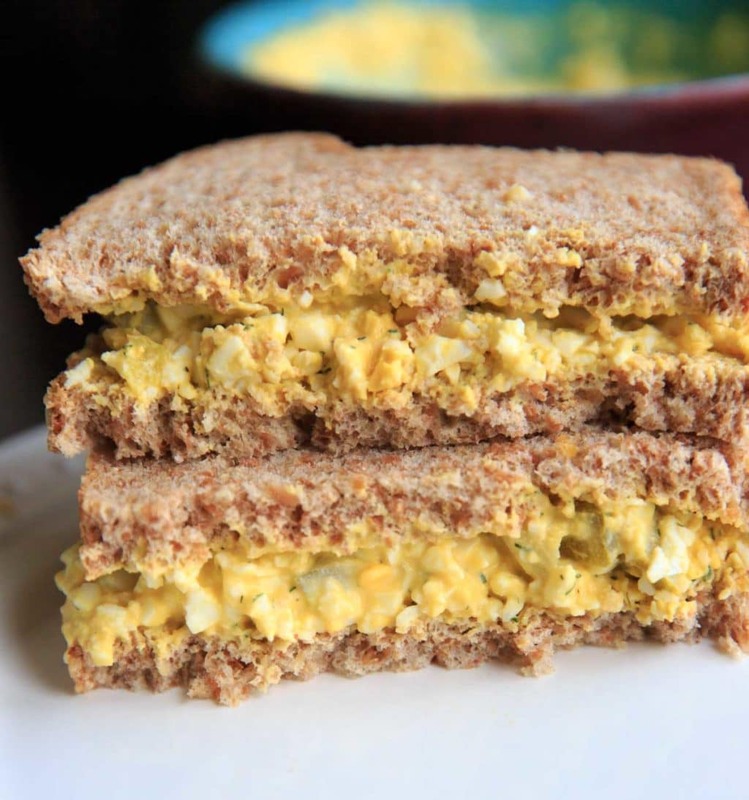 If you prefer your egg salad creamier, feel free to add more of it. Just be careful to not add too much more, especially if you plan on putting it in a sandwich! Between the pickles, juice and vinegar, I’m not sure how much more mayo this recipe could handle. Also – I used chopped dill pickles and celery, both of which I think are very important for the crunch in this egg salad. Maybe it’s the consistency issues I have with mayo but I think the crunch is key. 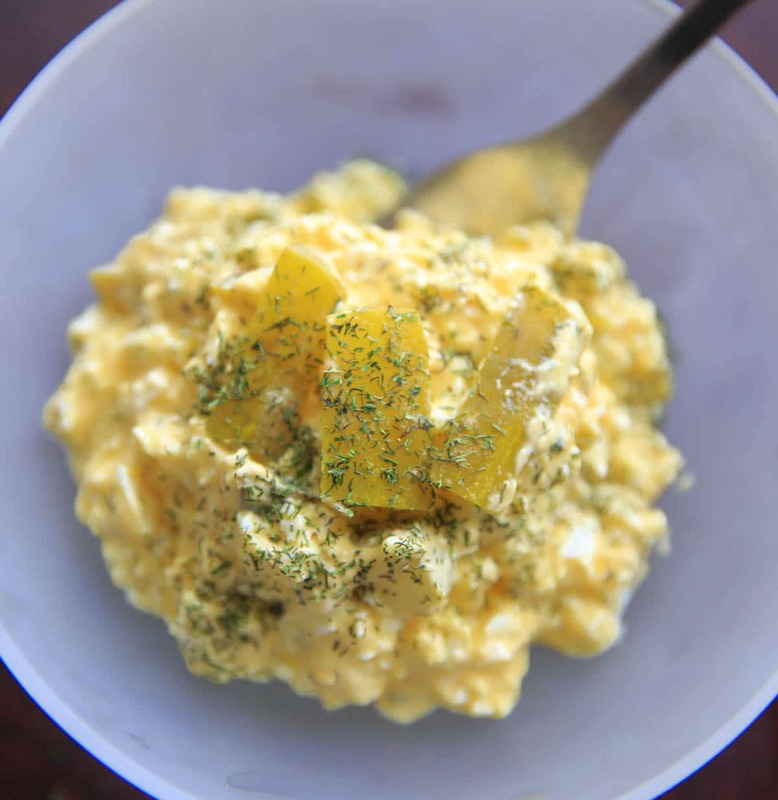 Many people like to add relish to their egg salad, so you can substitute dill pickle relish for the dill pickles. Since it’s a more concentrated flavor though, I’d start smaller on those measurements until you get to the flavor you want. I’ve been adding apple cider vinegar to so many things lately, it seemed normal for me to add a splash to this salad. But it’s optional if you don’t like that flavor. Side note: Everybody seems to have their own favorite way of hard boiling an egg, so I didn’t include my way. If you want me to write it up (I’ve tried many ways!) let me know in the comments! 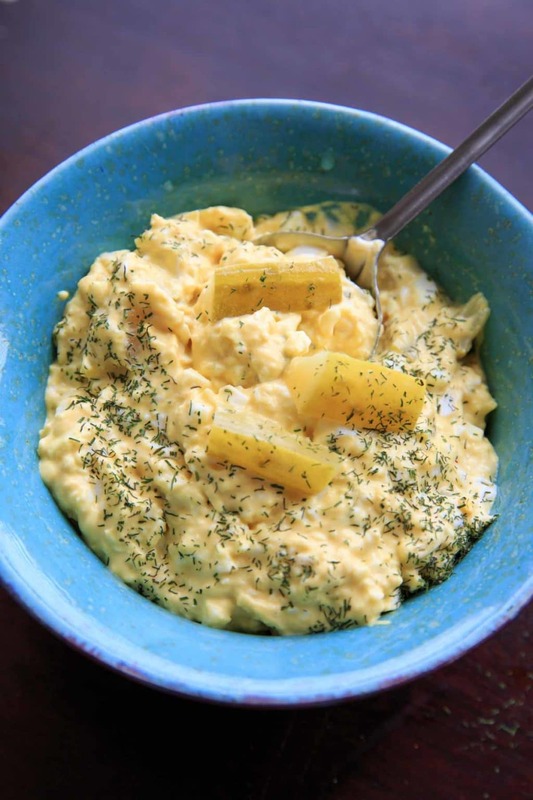 Dill Pickle Egg Salad - serve as a side or eat as a meal! Light on the mayo and big on the crunch! Great for pickle lovers. Mash hard boiled eggs in a bowl with a fork. Add all ingredients (chopped pickles, mayonnaise, mustard, celery, vinegar and dill) and mix until combined. Stir in salt and pepper to taste. Refrigerate until ready to serve. Garnish with more pickles or dill. * This recipe is light on the mayonnaise. If you prefer a creamier salad, add more mayo as desired. **May want to go lighter on the measurement if using relish instead of chopped pickles since relish has more flavor. Start with a couple tablespoons and work your way up as needed. You are speaking my language with all those pickles in there! I love dill pickles pretty much anyway that I can get them. 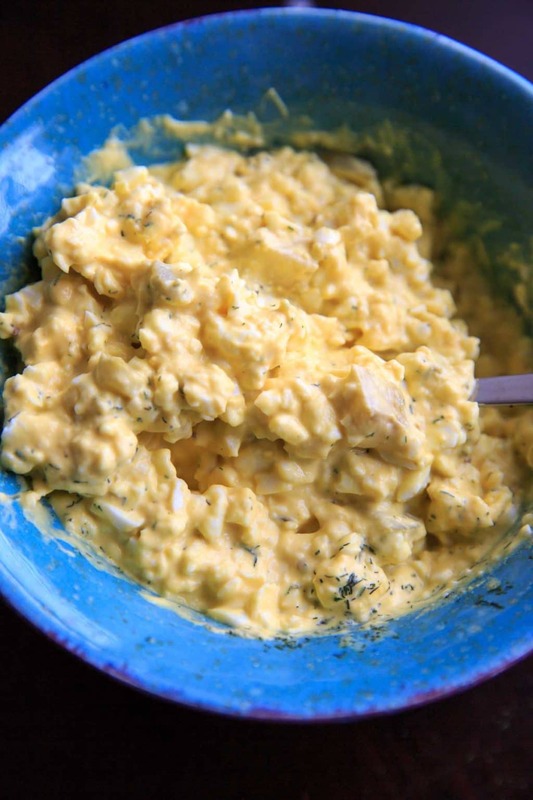 I love that you have lots of interesting ingredients in your egg salad…mine is pretty boring: mayo, relish, eggs. I’ll have to try this! I seriously love dill! And I am obsessed with pickles. Anytime those two things are in a salad my drool activates. 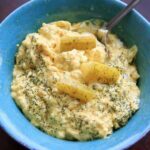 This recipe is perfect for summer! I would love to serve it as cookout side dish. Re: Hard boiled eggs. After many frustrating failures, I found this and I love it. STEAM THEM.